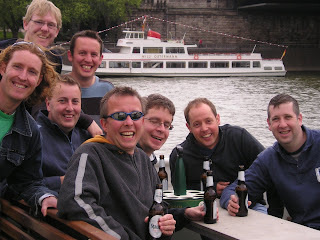 Beers save the day on a boring boat trip around the Rhine. 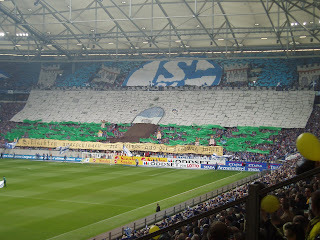 The away end at the Arena Auf Schalke. 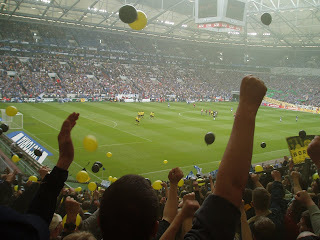 The Dortmund fans in full flow. The home fans do their best. 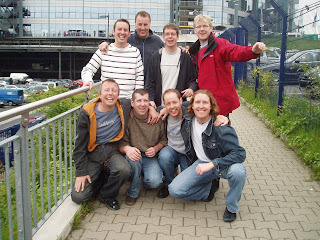 This European Football Weekend was organised by Nick for my stag do. It was the start of our love affair with Borussia Dortmund. They won at their fiercest rivals Schalke for the first time in umpty thrumpty years. We stayed in Cologne for the weekend, a City which was to become a favourite base for future EFWs. It was all go in between matches. It could only be Sweden v Denmark. Just prior to thrashing the local Portuguese lads. Outside the Estadio de Municipal Aveiro. Can you spot the Dutch fans!? Czech Republic v Latvia -More balloons than fans. In Coimbra en route to England v Switzerland. Another hard day at the office for Danny and Deaks (batting). 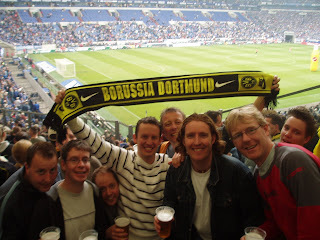 I thought I'd start adding some pictures taken from previous footballing trips. These ones were undertaken before I started writing about them. This one was one of the best. Strictly speaking this wasn't a European Football Weekend - it was a European Football Fortnight. Two of the best weeks of my life. 5 games of live football, friendly locals, good company, nice food, beers aplenty, beach cricket, great accomodation. It really was a carnival of football. 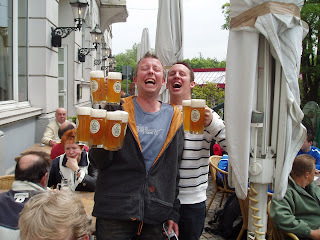 Four years have passed since this holiday and if you ever stumble across one of us in a pub, you'll probably still overhear us talking about how brilliant it was.